Following the sudden attack in Dang Barrack on Nov 23, 2001, the then-government declared a state of emergency in Nepal and mobilized the Nepalese Army (NA) in addition to the hard-pressed Police and Armed Police Force. During the resultant counter insurgency operations, in spite of efforts to operate within the domestic laws, some incidents of human rights violations did occur. However, these acts were either unintentional mistakes made in the fog of battle or the criminal act of an individual. They were not policy driven. Such violations were nevertheless unacceptable to the NA and as a result, the need for a Human Rights Organization within the Army was visualized. The Judge Advocate General (JAG) traditionally dealt with issues related to the International Humanitarian Laws (IHL) in the NA. In order to gain adequate knowledge to establish a Human Rights organization within the NA, a team comprising of the Adjutant General and Judge Advocate General visited the United Kingdom for a week to observe the Human Rights Organization of the British Army on May 3, 2002. The team forwarded its observations to the Chief of Army Staff (COAS). In the meantime, information on the Human Rights Organization of various Armed forces was gathered through the respective residential Defense Attachés. Based on the COAS Order, observation of HR Organization in the British Army, advice of the Legal Experts and Academicians, the Nepalese Army established a dedicated Human Rights Cell under the Adjutant General branch on July 8, 2002. The Nepalese Army receives the allegation. The allegation is passed to the Directorate of Human Rights, who studies the allegation and passes it to the concerned units. The concerned unit/subunit will conduct a court of inquiry (CoI) and will forward the findings to the Judge Advocate General (JAG). The JAG may conduct further CoI if required. If the JAG recommends, the COAS may appoint a court martial board. The verdict of the court martial will be published in the Army Orders. The verdict will also be communicated in writing to the organization or the person from whom the allegation was received. 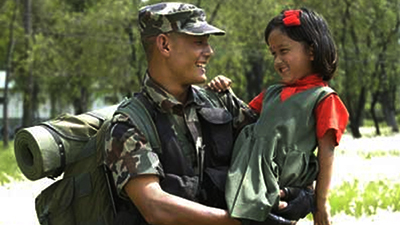 Besides, the Nepalese Army has integrated the teaching of IHRL and IHL into all army career courses. The DHR runs 6 days IHL basic course and in cooperation with International Committee of Red Cross (ICRC) it runs 5 days IHL advance course inside the organization. Until date, all army personals will be sensitized on the subject matter of IHRL and IHL and more than 42000 army personnel have been trained in the subject matter by the directorate. Apart from IHL training, the Directorate runs 2 days Gender basic and 6 Days Gender Training of Trainers (ToT) for the military personals. The Directorate has trained 2800 army personals on the subject matter of Gender equality and UNSCR 1325 & 1820. 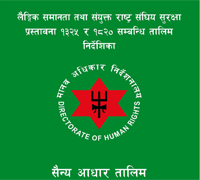 The Nepalese Army has issued various booklets and cards like the Soldier's Card, ROE Card, Human Rights booklet and Human Rights Year Book for the protection and promotion of IHRL and IHL in the organization. In order to facilitate commanders during any operation “Commander’s handbook on LOAC” published by the Directorate is being used. A documentary on Law of Armed Conflict has been produced. The Nepalese Army in coordination and cooperation with UN Women has developed 6 different training manuals in Gender equality and UNSCR’s 1325 & 1820, a docu-drama named “Tara” which shows the principles of UNSCRs 1325 & 1820 and a documentary on “Women friendly environment within the Nepalese Army” has been made and are being used as training aid. The Nepalese Army has taken punitive measures against those found guilty of violations of human rights and humanitarian laws. Such punitive actions range from imprisonment, prohibition from participating in UN Missions, demotions, etc.